Ursula Baldwin is a big fan of monarchs, but the ones she prefers live in her porch rather than Windsor Castle. 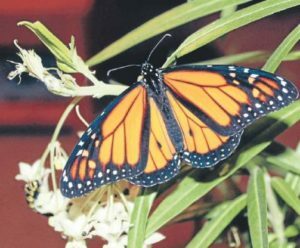 The Titahi Bay resident, with the help of her children, has been doing her small bit to help the monarch butterfly population for the past three summers. In her back garden she has swan plants, which attract caterpillars that eventually become chrysalises. The chrysalises are carefully transferred to a specially created tower in Ms Baldwin’s sheltered porch and, about this time of year, monarchs emerge. Last week, she had 60 chrysalises ready to hatch. Ms Baldwin is aiding, rather than manipulating, the process. It was also a valuable life education tool for her children, she said. “After not seeing monarchs around for ages, I started to find the caterpillars on the ground everywhere and after doing some research, found out they are disappearing. Having about 50 monarchs fly around her in Kura Park last year was an amazing moment in her life, she said. This time of year is important and Ms Baldwin is always hopeful of seeing dozens of chrysalises on the swan plants. She said 20 per cent would not make it to become butterflies, but she was helping the odds by providing a sheltered porch. She has become an expert on the subject of monarchs and has even devoted a Facebook page to her passion – search for Ursula’s Monarchs. Magical monarchs: Monarch butterflies can live up to eight months. 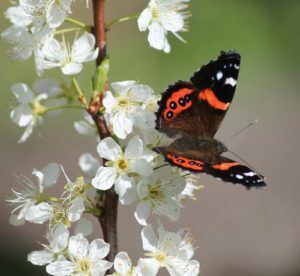 Top – by Sandy Werner, posted 22 September 2014, the NZ Red Admiral Butterfly (Vanessa gonerilla) endemic to NZ. The Māori name is kahukura which means red cloak. Seen in the garden now feeding on plum flower nectar. Bottom – Story from Kapi-Mana News 18 February 2014 pg 9, by Kris Dando – Butterfly carries regal charm.